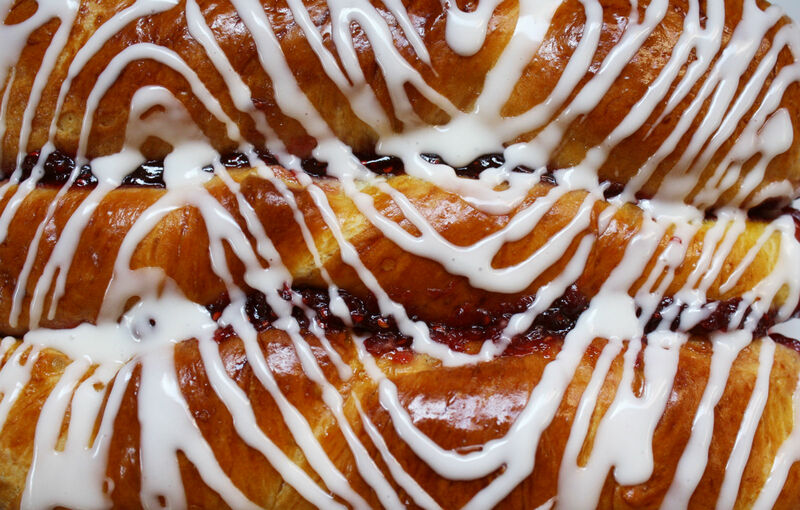 You can now make your favorite American danish in your own kitchen. I grew up in a home where almost every meal was made from scratch. In retrospect, I’m grateful for the delicious healthy food I grew up eating, but at the time, I coveted my friends’ fruit roll-ups, Capri Suns, and Happy Meals. Even though I wasn’t allowed to eat sugar cereals or drink most kinds of juice boxes, there were a few processed food items that inexplicably got a pass and were welcome in our kitchen. In fact, with a fair degree of regularity my father would come home with a white and blue rectangular box in his hand, the cursive “Entenmann’s” logo comfortingly visible. After spotting the box, a wave of anticipation would follow. Was it crumb coffee cake? Donuts? Cheese danish (please no, not this time)? Was it a really good day? 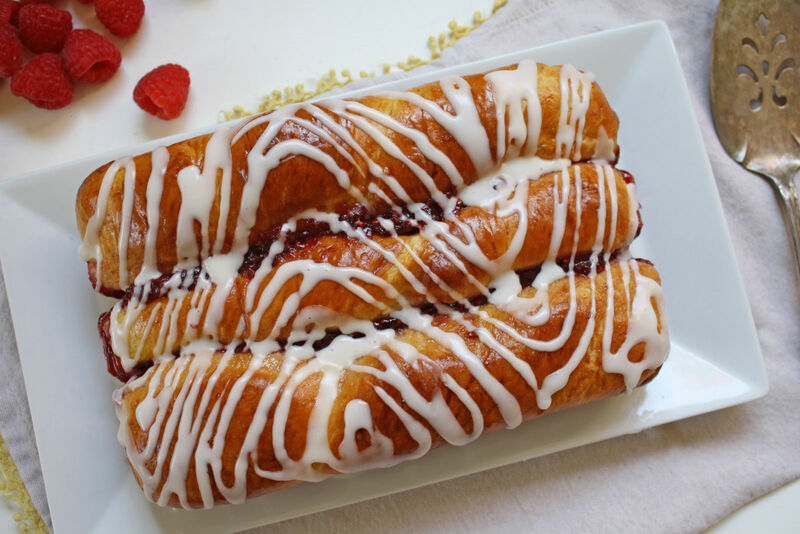 Did he get a raspberry danish twist? Maybe Entenmann’s got the junk food pass for its affordability (my father’s claim), or maybe it was because of its kosher dairy status. Price and kashrut may have been the reason my dad first bought an Entenmann’s cake, but it’s unlikely the sole reason we kept eating their pastries. Entenmann’s was founded in 1898 in Brooklyn by a German immigrant. Later, the company moved to Long Island and expanded its business with a home delivery service. Frank Sinatra was even known to be a regular customer. In 1959, the Entenmann family notably invented the now ubiquitous see-through cake box. Since then, the company has been bought and sold by multiple large corporations, but continues to make similar products to this day. As a kid, anything iced and sweet was A-OK by me, but as I got older, Entenmann’s lost its appeal and I all but forgot about its existence. Then one day at work not too long ago, someone brought in a box of Entenmann’s donuts. I felt the excitement of my youth. I opened the box and smelled that familiar cakey vanilla aroma. I took a bite into the waxy chocolate shell, and instantly remembered eating the same kind of donut, standing at the kitchen counter of my childhood home. My next thought was: “This is not quite as good as I remembered.” I looked at the list of ingredients: palm oil, soy, unpronounceable preservatives, food dye, corn syrup, and other ingredients that never found their way into any Bubbe’s kitchen. I will always maintain a soft spot for Entenmann’s products, and I mean no hate towards them. But it occurred to me that I could capture some of the joy of my youth by making my own homemade version of my favorite flavor of Entenmann’s: the raspberry danish twist. Traditionally danishes are made with puff pastry, but Entenmann’s dough deviates from the norm. Instead of puff pastry with its flaky croissant-like texture, they use an enriched dough more akin to brioche. To get that waft of vanilla from the danish, I use vanilla powder. I generally favor vanilla bean and vanilla extract, but there’s something about the powder that works here. Maybe it’s also because it reminds me of my grandmother; she put vanilla powder in all of her desserts, which made them taste different from anyone else’s cakes. 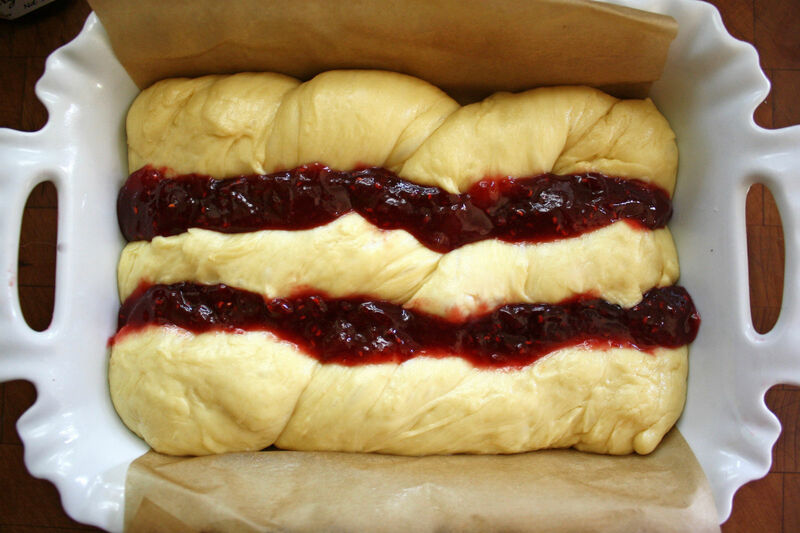 Once the dough is made and has risen, you form the danish and fill it with good raspberry jam. After it has baked and cooled, you top it with a required layer of icing. You can really form this dough into a variety of shapes and sizes, but I prefer to keep mine Entenmann’s-sized: small and rectangular, with a good proportion of filling-to-cake ratio and a generous amount of icing. The only other things this needs is a cup of coffee to go with it — and some lively Jewish banter. 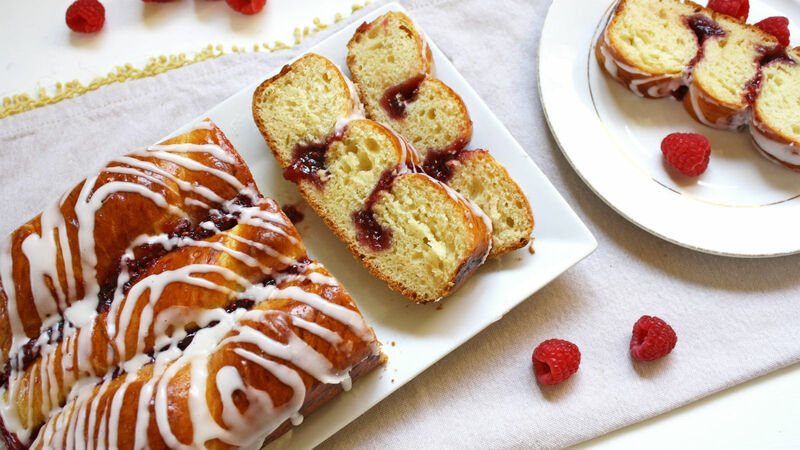 Note: This recipe can be made one day ahead of time, rewarmed, and iced prior to eating. Keeps for 2 days in an airtight container at room temperature. Heat the milk until warm to the touch but not too hot, about 100°F. Add the sugar and active dry yeast to the milk, and allow the yeast to proof for 5-10 minutes. The yeast will get foamy and bubbly, if it doesn’t, your milk may have been too hot or too cold and it is best to start again. Preheat the oven to 350°F. Add the jam to the danish. Between the 3 strands of dough, you’ll make two strips of jam, each about a ¼ cup of worth of jam, or ½ a cup per danish (if using a larger dish, simply evenly add jam between each strand). I gently nudge the stands apart, and with a spoon, fill with jam between the strands. Brush the top of the dough with the egg wash. Bake for 25-30 minutes or until deep golden brown on top. Rotate once halfway through baking.